After I made my first post about Paris In The Spring I wanted to make another post with some more pictures from my visit to Paris in May. For more details about the trip itself you can take a look at my last post; this time I mainly want to put up some pictures. One of the days I was in Paris I took a bus tour with some friends, that is probably the best way to see all of the things there are to see in Paris. 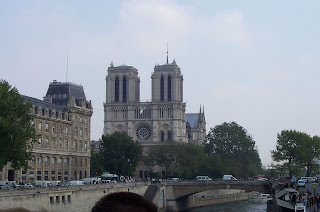 This first picture is of the famous cathedral "Notre Dame". 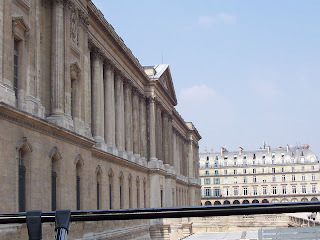 The next picture is of the Louvre Museum. What surprised me about this building was that it is so large. I had the image of it being a building similar to some of the other museum buildings that I had seen in other places. The Louvre however is huge and this picture shows just one end of the building. I also thought it would be interesting to just show a city street in Paris. Every city is different and this is one of the streets I passed through during my stay. The last picture may seem odd but I have found it a bit fascinating to see how the police dress in different cities and countries in Europe. 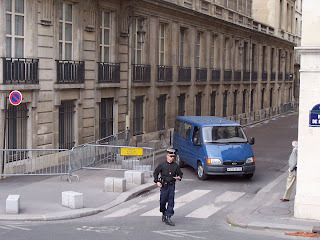 This is a picture I took on my bus tour of one of the types of police they have in Paris. I can't tell you exactly what all the different kinds are but I do know that there is more than one kind. I hope you enjoyed seeing some of the pictures I took in Paris. In the future I plan to post some more pictures along with my blogs. 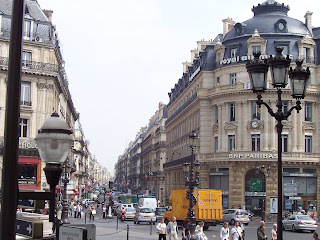 If you want to find out more about Paris itself I found what seems to be the official website at www.paris.org and this site has plenty of good information and pictures.